This vibrant summer soup is made with vine-ripened English tomatoes, oven roasted to bring out their natural sweetness. Preheat the oven to 220°C, gas mark 7. Place the tomatoes, red onion and garlic in a roasting tin and drizzle with the olive oil. Season and roast for 20 minutes until softened and slightly charred. Put the bacon onto a rack set over a baking sheet and place in the oven for the last 15 minutes of the tomatoes’ cooking time. Remove when crisp, leave to cool then break into pieces. Meanwhile, crumble the stock cubes into a large pan, add 1 litre of hot water, mix well and bring to the boil. Turn off the heat, add the roasted tomato mixture and whizz with a hand-held electric blender until smooth (or allow to cool slightly then pour into a blender in batches to liquidise). Ladle the soup into 4 bowls then drizzle with balsamic vinegar. 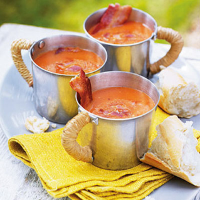 Scatter a few pieces of crispy bacon into each bowl and serve with crusty French bread. This soup is also delicious served cold. Chill and serve with balsamic vinegar and torn Parma ham rather than crispy bacon.